East of Austin near Whitehall, Texas, I came across this colorful field of bluebonnets and indian paintbrush on an early April morning. When I arrived, the clouds were low and not so great. After sunrise, they began to fade, blue skies arrived, and it was just the bumblebees and me in a wonderful field of wildflowers. Recently I traveled to my home state of Texas to attend the wedding of a dear friend. Rolling along on a beautiful (if not steamy) June day, I could not help but feel grateful for the remaining wildflowers scattered across the roadside. 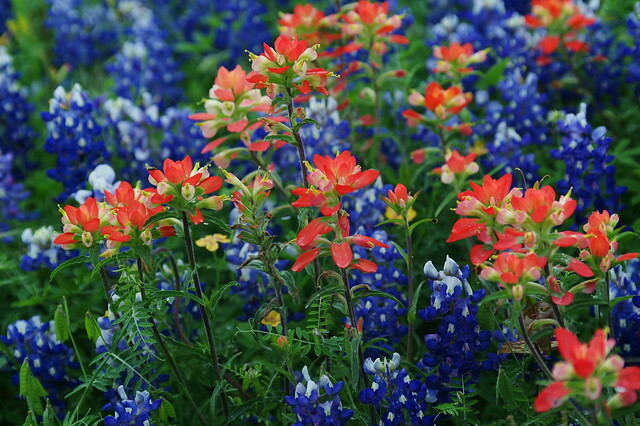 Every time I see wildflowers on the side of the road, I think about beautiful Texas bluebonnets and Indian paintbrushes- thanks, of course, to Lady Bird Johnson. During her childhood in East Texas, Lady Bird grew up around bayous and natural habitats which inspired her love of preservation. In 1934, Lyndon B. Johnson traveled to Austin and there met Lady Bird. After a courtship of only 3 months, they married and on her finger LBJ placed a ring that he had purchased from Sears which cost a whopping $2.50! Eventually, the Johnsons made it to the White House and for nearly six years Lady Bird was First Lady to the 36th President of the United States. During this time, she spearheaded the Beautification Campaign dedicated to environmental preservation. On May 24th, 1965, Lady Bird spoke about Natural Beauty at a White House Conference. Over the next few years, this speech would inspire a variety of environmental and conservation legislation. Because of her continued support, this legislation came to be known as “Lady Bird’s Bill.” The bill called for control of outdoor advertising including removal of certain types of signs along the nation’s Interstate. It also required removal or screening of junkyards along Interstates and highways to enhance picturesque landscapes and promote roadside development. In 1982, Lady Bird and actress Helen Hayes developed the National Wildflower Research Center to help preserve the native plants found across the country as well as protect natural landscapes. Originally, the center was opened with a personal donation of sixty acres of land near Austin by Lady Bird. In 1998, by unanimous board decision, the center was renamed to the Lady Bird Johnson Wildflower Center, however, the mission was the same. Today the facility has grown to 279 acres with over 700 plant species displayed. The center also offers education programs for both children and adults. quality we pass on to our children and the future. The next time that you drive along on the American interstates and highways think about Lady Bird Johnson and the amazing legacy she left on our landscape. For more information about botanical preservation or to donate to the center, visit the Lady Bird Johnson Wildflower Center online at www.wildflower.org. You can also read more about Lady Bird Johnson on www.firstladies.org/ and also the officialwhitehouse.gov biography. As always, if you know of a person or organization that has made an impact on the community, please nominate them for this series. Email me at Rebecca.Carlson1984@gmail.com with the subject line “Spotlight: Philanthropy” and a brief description of the person/organization and their achievements.